My first attempt at online dating was pretty much a disaster. I’m sandwiched into the foyer of a crowded and trendy brunch spot, waiting for my first-ever Tinder date to show up. I’ve dressed in jeans (which feels positively formal since I usually live in my Dharma Bums leggings), and I’ve even combed my hair. My stomach is churning. Ethan walks in the door, and I recognize him. Thank God. He actually looks like his picture. “Uh, hey,” he says and smiles. He’s tall and has a cute gap between his two front teeth. “Hi, uh. Nice to…uh, hey!” (Awkward hug.) I bite my tongue from saying, “Nice to meet you,” which would surely advertise “FIRST DATE” in neon letters to the lounging hipsters who no doubt smell Tinder all over this. We get ourselves sorted, take control of the menus (I’m clumsy with mine; it feels like an ungainly, fluttering bird), and we manage to order. “So, um, where are you from?” I venture. He speaks and eats slowly, as if he’s taking the measure of everything in his mouth. Later I’ll learn that this is how Ethan moves in the world: slowly, carefully, and with deliberate intent. “Oh wow. East, uh, me too. Born in good ol’ New Hampshire, you know the uh, live free or die state! Yep, we’ve got some fight.” My face feels weird. I realize I’m smiling really widely. I try to stop it, but I can’t. It’s alarming, kind of like the Joker in Batman. Maybe talking will fix this problem. I start to have an out-of-body experience. Where was this horrific, vomitus chattiness coming from? Poor Ethan. Barely a word out and here I was submerging him in a horrible torrent of small talk. I try to stop talking, but it’s as if a dam has been released and the water just won’t stop. Apparently, I become an unbearably chipper one-sided conversationalist when I’m uncomfortable. During a date, we are often painfully self-conscious. In our discomfort, we can choose to either fall back into our protective habits, or instead to practice the pause, take a breath, and make a choice about how we want to act. 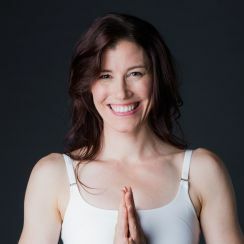 While I’d experienced “awareness” before on the yoga mat, diving back into the dating scene became an opportunity to put this pause into practice while in the good company of others. Because we’re usually a little freaked out, dating is the perfect place to practice mindfulness. Because we are nervous, our senses become heightened and time feels like it slows down. While I’d experienced “awareness” before on the yoga mat, diving back into the dating scene became an opportunity to put this pause into practice while in the good company of others. And in this awkward space, we have a choice. We can either run on autopilot by defaulting back to our comfortable control strategies, or we can practice the pause and choose how we want to show up in each moment. If you start to put yourself out there on Tinder or Plenty of Fish, you may have a lot of first dates. Each one is an opportunity to put yourself back in the fire of not knowing. To start with a blank canvas and see what you create. After Ethan, I went on a lot of first dates. While I still wanted to fill the silence with my babbling, I began practicing the pause and waiting. At first, the silence I allowed felt interminable! I squirmed, I blushed, I literally had to bite my tongue. But as I practiced, I became more comfortable staying in the void. And when I did, my date would often find something interesting to say that would take the conversation in a marvelous and unexpected direction. By practicing the pause, I came one step closer to being the good listener I want to be. Not just in dating, but in all my relationships. By questioning our default patterns, we become artists of self-creation. Our actions become the colors we use to create the masterpiece of our lives. Because dating usually makes us self-conscious, it’s the perfect time to both witness and transform our habits. Each and every time we show up for a coffee date, we can take a breath and treat it as a twenty-minute practice. Do we want to practice compassion, honesty, good listening—even when we feel like our feet are in the fire? Here is an opportunity to step up our game and consciously embody our best vision of ourselves. We are not showing up as our best selves to make a great impression or to wow our dates. We’re showing up as our best selves for us. Because we have a vision of who we want to be, and how we want to uphold ourselves in the world. Return, moment by moment, to the extraordinary power of your own ability to choose who you want to be. Your small daily acts will change the world. You will inspire others. We will all shine more brightly. And most importantly, you’ll align your actions with who you want to be.